Demanding architectural projects gain their aesthetic identity through perfect harmony of colors, shapes and materials. Architectures are highly demanding when it comes to harmonic relation between exterior elements and window shapes. Color profiles, especially in the area of public and residential buildings give the opportunity to imprint your personal style and individual character. Acrycolor windows of GAELAN system provide many possibilities regarding creativity, imagination and joy for experiments. Acrycolor window profiles are recognizable by its full color. Standard programmes include 11 modern colors. More acrylcolor tones are available upon request. These coloured profiles set accents in your facade making your house as individual as its inhabitants, or turning any building into an eye-catcher. Red colour is the colour of signal and symbol of strength, dynamic, liveliness and warmth. Details on the red one are clearly visible and function as stimulating element. With its brightness, red is magically eye-catching. Brown colour is one of the warm colours. It gives the sense of equanimity, unity, firmness and it is used for rustic materials. Brown is eternal, permanent and the most long-lasting colour among all colours. Grey and green one provide decent, reticent and harmonic colour. Green is the colour of nature and freshness. Grey is the colour of something real and neutral, and in combination with the silver one is gentle and representative. Blue colour is the most popular colour for stairs. It seems cool, pleasant, true and gives the sense of clarity. The combination of blue, green and white is symbol and the sign for relaxation and recovering. Window colour profiles set accents in your facade making your house as individual as its inhabitants, or turning any building into an eye-catcher. You can choose among 12 coextruded acrycolors in order to give your facade an elegant and monochromatic look, or lively and strong contrasts. Also, it is possible to use acrycolor to emphasize design suggestions as well as typical regional colours. Certain coloured profiles are everywhere where it is necessary to direct people to doors and elements around the main entrance in buildings. GEALAN has been coextruding profiles since 1980. Our experience in this field has been rewarded with the RAL certification as well as the South German Plastics Centre seal of approval. A thermal process used to fuse the profile’s base form (at this stage still made of molten white PVC) with molten acrylic in an unbreakable bond. The molten acrylic is applied to all surfaces that will later be subjected to the harsh effects of the sun, wind, rain and snow. As the profile leaves the two coextrusion dies, it is already two-coloured. Two-coloured acrycolor profiles (outside in color, inside white) are produce during the process of coextrusion. This process guarantees long lasting colours. Even when it comes to changing window in development stages, there are no visible differences on windows. The sun’s rays are reflected by the white layer underneath the infrared-translucent acrylic coating, thereby reducing the heating effect on the profile to a minimum. The difference in temperature between standard white frames and acrylcolor frames is astoundingly small. Windows made with acrylcolor profiles have a silky smooth surface. 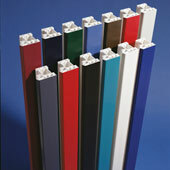 The molten fusion of acrylic and PVC under extreme temperatures gives acrylcolor windows their unique toughness. They exhibit not only a high resistance to scratches, but also to dust and grime. In millions of automobile rear lights, acrylic has proven that it can withstand years of aggressive weather. This same acrylic material is used by GEALAN to create the coloured surfaces of its acrylcolor profiles. This makes the profiles almost impervious to bleaching or fading, even in extreme weather conditions. Profiles with acrylcolor are extremely robust, showing no signs of ageing after years of use, even when compared to new profiles. Acrylcolor windows are practically maintenance-free and incredibly easy to clean. They are dirt-resistant and can be wiped clean with standard cleansers. Since they never crack or peel, there is no need to repaint, saving money in repair costs. Acrylcolor windows are fully recyclable. Profile trimmings are returned to the material cycle as well as are regranulated plastics from former windows. The result is a high-quality ingredient that can be used in creating new products, thereby helping to ensure a closed circle.